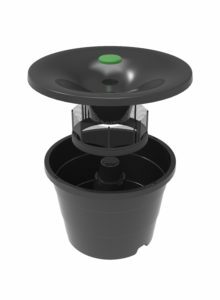 The In2Care® Mosquito Trap is made from durable polyethylene, which lasts several years under tropical conditions. The gauze strip on the trap floater needs to be replaced (using In2Care® refill sachets) every 4-6 weeks for optimal activity. We recommend area-wide outdoor deployment, using densities of approximately 1 trap per 400 m2 (10 traps per acre) in high risk areas with many Aedes mosquito breeding sources. Trap assembly: In2Care Traps need to be filled with water (4.5 Liters) and activated with a biocide-treated gauze strip from the refill sachet. The gauze is fitted on the floater component and needs to remain dry. We advise to first place the trap in its final position before adding the gauze-carrying floater on top of the water. The remaining powder and odour tablets from the sachet need to be added to the water. As a final step, the trap lid is placed on top; fixating it with a twisting movement. The green time indicator can be used to monitor time of placement and when to service. Trap placement: We recommend placing the traps in shaded, vegetated areas, where mosquitoes like to breed. A solid, level underground is necessary for stable placement. Ideal locations are in corners of outdoor porches, underneath garden sinks, near shrubs, etc. Additional securing tools (ground pins or tie-wraps) can be used for firm placement on different surfaces. 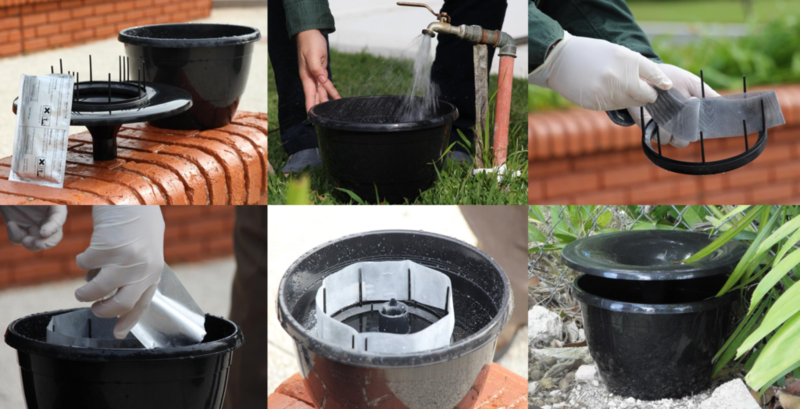 Trap maintenance: Water needs to be topped up every few weeks, depending on the climate. We recommend at least 0.5 Liter of water in the traps at all times for optimal outcomes. Refresh the trap with a new refill sachet every 4-6 weeks. Remove the old strip of gauze and the remaining water, assemble the trap with fresh water and a new piece of biocide-treated gauze as described above.